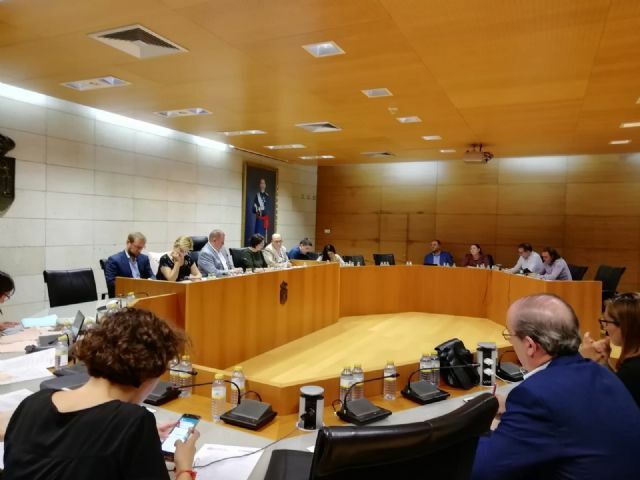 The Plenary of the City of Totana agreed last night, in the ordinary session for the month of October, with the votes in favor of the PSOE and Win Totana-IU and the abstention of the PP, the motion of the Mayor to adopt the firm commitment to modify the corporate bylaws of the CEDETO, SRL company and revoke the rating of its own medium in the period of 2018 and 2019, so that from January 1, 2020 the Special Employment Center can operate as a company in the ordinary market. It was also unanimously approved the joint motion that included the institutional manifesto of the International Day against Violence against Women coinciding with its celebration on November 25 and declare Totana as a Municipality Free of Gender Violence, carrying out various awareness activities in a manner coordinated with the Municipal Equality Council. In this sense, it was agreed, among other objectives, to strengthen the economic and human resources destined to the development of active, comprehensive and participative equality policies, insofar as possible, for the achievement of a society free of gender violence, putting special attention to women in a situation of special vulnerability. Similarly, unanimously approved the modification of specific points of various tax ordinances and the repeal of the regulator of the fee for special use of the local public domain in favor of companies operating services of supplies of general interest. and that, through the Department of Education, the participation of students is encouraged in the educational centers. and a study is made on the demands of the students of the different educational centers and they are sent to the competent body to solve them. In addition, it is argued that from the Department will prepare some training so that municipal school counselors and center can perform their work properly, among other suggestions that collected the initiative. The Plenary unanimously approved the motion of the Popular Group to urge the regional government to study and take into account to implement support plans and boost cultural tourism in order to highlight all the potential of this sector in a way that generates a greater economic growth throughout the year, given the growth capacity that houses this type of tourism. and urging the Ministry to study the needs and expansion of gastrointestinal specialists to give full coverage to all Health Areas. Similarly, the motion to win Totana-IU, unanimously, was approved to urge the regional government that the amended Law on Gambling and Gaming include the development of a regional strategy for the prevention of gambling, elimination of advertising commercial of gambling halls and sports betting during children's hours, including sports events broadcast on radio and television and preparation of a territorial regulation of gaming and betting rooms. In addition, it is advocated, in the motion, to prevent its concentration or installation in special places of risk as therapy centers for gamblers, primary and secondary schools, health centers and sports facilities, specifying the minimum distance of location in relation to other places , never less than 800 meters. This proposal also included urging the Ministry of Health to develop an addiction inspection plan, including specific actions aimed at gambling and betting salons to ensure compliance with regulations and ensure rapid and effective assistance to people who request aid for addiction to gambling, including in the portfolio of services of all the centers of the Network of Attention to Drug Addiction the attention to the problems derived from the addiction to gambling. Finally, unanimously agreed to the proposal of Win Totana-IU for the City Council to urge the Ministry of Finance to amend the Law on Financing of Local Corporations in order for vehicles to pay their taxes in the Municipality , specifically the IVTM in which they provide their services, where the companies that own or use them are located. Out of the order of the day, knowledge of the resignation of the Popular Group councilor, Francisco José Martínez Casanova, was taken from his minutes. and agree that the municipal government enable mechanisms necessary to guide the neighbors in case they want to demand the refund of the unduly collected amounts. In this motion, which was voted by points, it was approved, with the support of all groups and the abstention of the PP, to urge the central government to promote the creation of a public banking center, paralyzing the sale of Bankia, and directing the management of the savings deposited in this public banking to the attention of the social needs, the development of quality and sufficient public services, and the eradication of unemployment.